My tears started flowing freely last Friday night just three minutes after I had taken my seat at the Ndere Centre. I was hosting a couple of journalist friends from Finland to a night out on the town, on their first visit to East Africa, and Uganda in particular. This should have been their first evening treat in Kampala but we had to push it to the last night because of scheduling issues since they had arrived so late the Saturday night before and immersed themselves straight into work. Even as I was considering the idea of going to the Ndere Centre with them, I was emotionally shaky because of my links to the place; Stephen Rwangyezi, the proprietor, producer, lead performer and cultural guru, had been my primary school music teacher and made quite an influence on my life – directly and through my brothers as well. As I was taking my seat I marvelled at the way his personal energy was projecting from the centre of the arena through the open amphitheatre that guests occupy at this place. The first time I had visited this place, in Kisaasi, the road there was dusty and the trip a little taxing, but the passion he expressed as he walked us round the venue back then made it look as neat and flowery exactly as it did last Friday, and the comparison unnerved me considerably. In my mind, the first real home of the Ndere Troupe was in my childhood neighbourhood in Lugala, at the very top of the hill where my parents now live and that we all lovingly call home, where the dancers had (maybe still do) dormitories and practice areas whose drums sounded every so often without irritation and complaint from those of us in the surrounding area. So when Rwangyezi began the move to Kisaasi it was natural for us to pay a courtesy call, and again a couple more times thereafter, noting on each visit how much closer he was to achieving the dream he had set out for back when I was still an impressionable, wet-behind-the-ears child, wide-eyed at his wealth of culture, melody and humour. Last Friday, I was an adult again wide-eyed at this wealth of culture, melody and humour, and wet in the eyes at how well this man has done for himself and for his country. In fact, I was a little ashamed that I had gone so many years without coming back here. This year Ndere is celebrating thirty years in existence – Rwangyezi launched his group back when he was my music and drama teacher, and I remember the temptation of joining him but I but had far superior rivals who didn’t take up the opportunities either. Two of them – Peter Kagwa and my young brother Paul – now run their own events management firms, no little thanks to his personal tutelage back then. 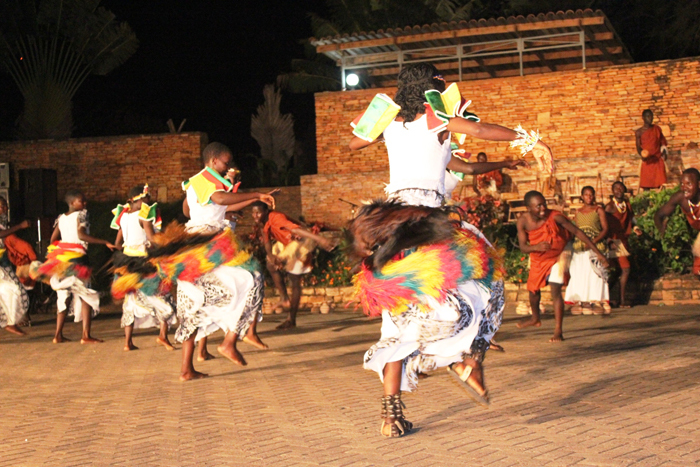 Watching the performances, I realised that many of us cherish weekends because we get to attend traditional ceremonies where the highlight, let’s be honest for a minute, is the dancing and singing by hired troupes such as Ndere and the many branches that have sprouted from Rwangyezi’s brave move starting a cultural troupe. Some of you only watch national ceremonies on television because of those traditional dances. That night, Rwangyezi introduced an old Munyankore man who he said had left his home comforts to join Ndere so that the cultural knowledge he had in his head could be shared with the next generation. Later, he had us learning how to respond to akarimojong – with “Maatta” – and went through a volley of greetings led by a nubile ngakarimojong who enquired after the weather, cows, crops, rain, soil, furniture…everything. And all was “Maatta“. And after the akarimojong greeting tutorial, he announced: “In our cultures when we greet we don’t just say ‘Hi-Hi!’ …I mean who is low? !” triggering another burst of laughter at the unexpected flippancy. The entire Ndere production is amazingly creative, maintaining the authenticity of our cultures while mixing in modernity in movement and choreography, punctuated by Rwangyezi’s humorous narrative that makes you feel, in those muscles at the top of your shoulders, as if you could have spent the evening at a stand-up comedy show but are getting much more value for your shillings. And for me, the flow of the dancers brought fresh tears with each successive dance. 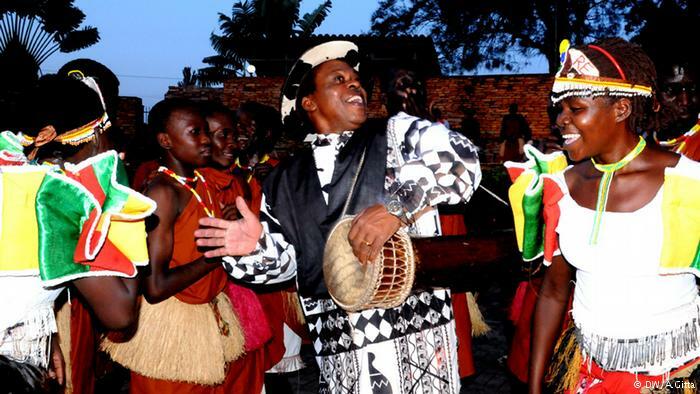 When the Rwandese Warriors broke out with Nyaruguru I remembered many a night with my father-in-law smiling in appreciation and a couple of times joining in the dance to this very song, performed live by Jean Paul Samputu himself. Some of you may never have heard of the trumpets of West Nile, even though you do know names like Louis Satchmo Armstrong and fork out ten times the Ndere entrance fee for the annual Jazz Safari. The Agwarra and Adungu sounded fantastic and led to a humorous lesson in geography and history narrated by Rwangyezi in full and embellished as, “The Agwarra and Adungu played by Adiku of the Alur, whose neighbours are Arua and Adjumani and produced a President called Amin…”! The thundering Barundi drums heralded in the climax of the night but could themselves have allowed us to leave on a justifiable high. But that was the job of the Larakaraka, erupting in Ndere’s signature pot-balancing dance – high tempo, technicolour, upbeat, vibrant, vibrating, throbbing, promising, pulsing, pulsating, undulating, ululating, mellifluously causing us to draw in breath while cautiously applauding with an irrational fear that out movement might topple the pots the girls had stacked on their heads….Two, three, four…seven, eight! NINE pots stacked on the heads of girls with different hairstyles, of different height, all gyrating and swinging and smiling and weaving in and about each other in the choreographed beauty that Uganda always presents if you visit the right places and meet the right people – as my Finnish friends did last week. everyone: to the Uganda Museum, this weekend! Come one, come all <— we grew up reading this phrase on every single damn poster for every single damn event. Where did it go? Why did we stop using it? I liked it. It had authority and gravitas. It invited you, and then on second thoughts instructed you to bring a friend. 1. To get an up-close look at some really beautiful flower and plant arrangements put together by passionate enthusiasts who actually know what they are doing. 2. To buy said beautiful flower and plant arrangements for your own home. 3. To buy said beautiful flower and plant arrangements as Christmas gifts for loved ones – which they will appreciate greatly unless you promised them a car, a busuuti or an Xbox-something. 4. To meet people who will be useful in helping you transform your home and make it amazing in 2015 – and THIS is the time to do this, since we are in the rainy season (one of them, for Uganda) and anything you plant roundabout now will certainly thrive! 5. To support something positive, if you are not going for the #PimpAkiba event sponsored by @40days_40smiles people today (Saturday). This #PimpAkiba event, by the way, is the painting of the Cancer Children’s Home that these young people have supported the whole year through with a dedication that would put most Parliamentarians and big corporates to shame for being so massively impactful yet pushed by gestures so little. 8. Visit the Uganda Museum, generally. Have you taken your children to learn about their own history? When were YOU last there? Here’s an opportunity, and one you come away from with a souvenir that you will never forget and that beautifies your home. 9. Very many other reasons that make absolute sense, whichever way you consider them. And if I were vain or of the name-dropping variety, I’d list people you are likely to meet there, besides myself 😉 . 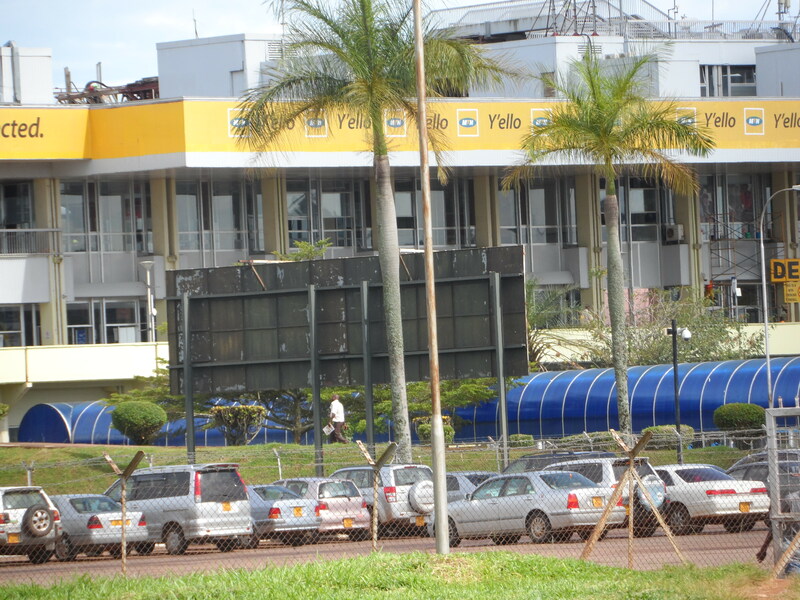 Last week I returned from a trip out-of-country to a comedic reception at the Entebbe Airport Long-Term Parking Terminal. I found myself starring in a comedy of errors so deep that I suspected someone had paid actors to stage it. For a panicky while after I got there, the chaps managing the parking system couldn’t find my receipt and therefore car keys. Eventually, though, we discovered them after working out that the fellow who had taken my keys on the morning I left had registered HIS name on the system instead of mine. Too tired to properly psycho-analyse him in front of his colleagues, and eager to get to a dinner arrangement in Kampala, I politely swept up my keys and walked over to where I had parked – in the furthermost corner of the parking lot. There, I found that a vehicle had been parked right behind mine and was blocking my exit. I could not understand how this had escaped the notice of the parking lot attendants, since my car was not the common type, or why they had let me walk all this way with my luggage without even a word of warning. I stood there amazed that they hadn’t followed me all this way to unblock the car, and noticed that a colleague of mine was also having a bit of a struggle. So I went over to see if I could be of help. His car, not blocked by any other, had refused to respond to his key remote fob. It was clear to me that his car battery was dead, but to confirm this we had to go through a couple of hours filled with high-level comedy during which ‘the man with the key went’ and someone else even licked a dry cell to test whether it was functional. In the background of the comic action, I caught a story over my car radio that slapped me with irony. It was about a five-year old child called Ayan Qureshi, who is now the world’s youngest Microsoft Certified Professional. Microsoft IT certification has not become any easier – this five-year old child just knows his computers so well that he passed the IT Exam. As the BBC people marvelled over this computer-savvy toddler, we discovered in the parking lot that the reason my colleague’s car battery had run out was whoever parked it had left the interior lights on for four days or so. You would imagine that a fellow working at a parking lot would know this basic rule of car management, even if he didn’t stand any mental risk of earning Microsoft IT Certification as a young child. To make matters worse, when we finally got the bonnet open, one of the parking lot employees exclaimed that he had been right all along because when my colleague was parking his car there had been someone else there whose vehicle had suffered a similar mishap. “Don’t you remember that guy you found here? It was the same problem…!” the chap said with misplaced triumph in his voice. It would be grossly unfair, I reasoned, to compare these parking lot attendants who had so little of a plan for managing their few square metres of space that they could register you wrongly, block you in by parking awkwardly, and then allow your battery to run out by simply forgetting to flick a light switch off. dear supermarket guy; please make us all buy Ugandan? They are very young, my little ones, and I don’t want them to get too old before they undergo this basic lesson in economics. 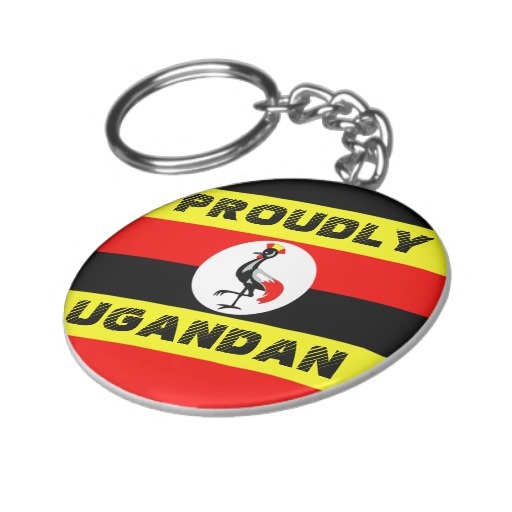 You see, if they join the army of shoppers that concentrates spending fire on products manufactured in Uganda then they will eventually win us the economic war of building Ugandan industry – cottage, small, medium and large together. Unlike you and I, supermarket guy, these children are being raised in an age when there are actually good, respectable, competitive Ugandan products on the shelves. Of course you are younger than I am, or came to Kampala long after I did, so you cannot possibly recall a time when there were no supermarkets besides Ugantico (run by Nasser Ntege Sebaggala) or outlets such as the confectionary of Mrs. Ofungi in Kisementi and Bimbo Ice Cream Parlour of the Mukulas (Mike and Gladys). You might have no clear idea of an environment where scarce products were called “England” as evidence of quality and ‘authenticity’ as opposed to “China” for cheapness and potential fraudulence. That’s why you probably don’t get confused when you walk round your home today and find that most things are actually made in China but are not really disintegrating on impact every time you touch them. And right now you might not be aware that all those decades of this “England-China” identification form what sociologists might call “normalisation”, which is why you cannot understand the product-inspecting actions of my children. That was one of the lessons of my university days that stuck – “normalisation” and the cementing of certain ideas as believable facts that we grow up with and cannot break away from. It’s also why we generally think toothpaste is synonymous with Colgate, cereal with Kellogg’s, and coffee – we are so stupid – with Nescafe. My children know different and will continue to be told different. Which is why, Supermarket guy, I bring them shopping and make them check labels before we buy anything. Actually, it is only one of many reasons. I also need them to know how much stuff costs so that they work out what it means for us to buy them supermarket food. But it is a major reason – the ‘Made in Uganda’ one – because we need them to understand that if we buy products made in Uganda then the bulk of the money we spend will stay in Uganda, with people working in Uganda. If we bought honey made in Australia, for instance, you would still earn your wages; but when we buy honey made in Uganda then some bee-keeper in Bulindi, Hoima or or Mutolere, Kisoro might soon be shopping with you as well and your wages might increase. If that bee-keeper also buys his or her raw materials and tools of production strictly Ugandan…I’m sure you catch the drift? So these kids of mine who appeared to irritate you by their inspection of every packet of everything, are actively protecting your job tenure. 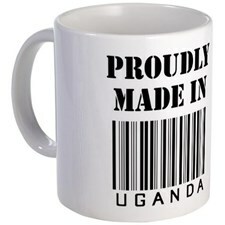 Rather than brush them off, my supermarket friend, you should make yourself an authority on where the products made in Uganda are. 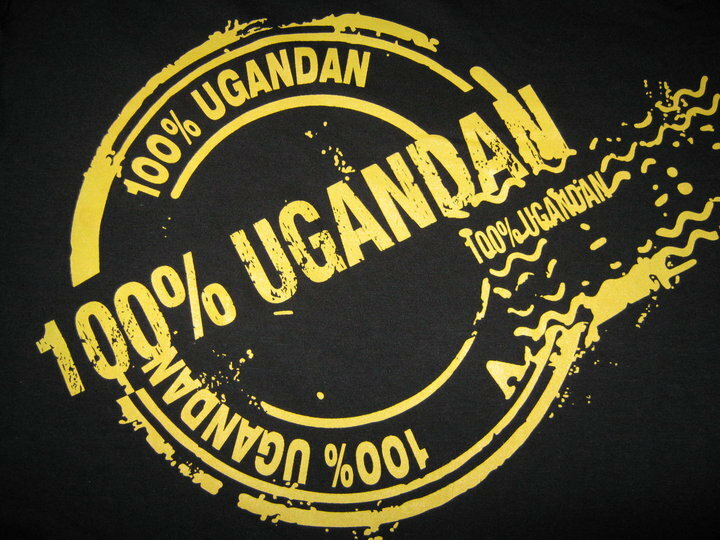 If your supermarket and the Ministry of Trade and Industry are too short-sighted to create a ‘Proudly Ugandan’ campaign with dedicated shelves for products and staff assigned to chaperone money back into the economy in this way, then YOU do it yourself. vast, ignorant majority push for foreign exports then you will stand out and be more valuable than the rest. It won’t be long, I assure you, before one of these Ugandan companies sweeps you up to join their marketing or sales or product development departments. 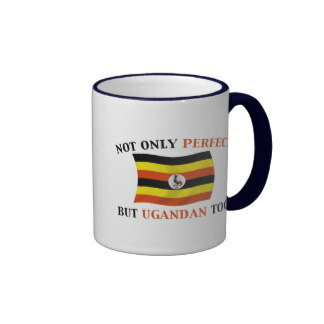 And in any case, which is easier – for a French Coffee or Egyptian juice company to spot and employ you, or one of our Ugandan ones whose owners and managers actually meet you on the shop floor? I’m telling you the truth, my friend, focusing on foreign imports rather than pushing our local products will keep you down there shuffling boxes for a long, long time. So when these little kids and their parents approach the shelves to choose biscuits or juice or crisps or pencils, point them in the right direction. A direction in which even your own progress and prosperity might lie. Friday night I arrived at Entebbe Airport mentally prepared to crawl through the traffic to make it for a very important personal dinner with family. Within minutes of arriving at the long-term parking office a sense of foreboding began to come over me as the two chaps there searched high and low with that puzzled look on their faces of “Oba what…?”<—said properly, this is the classical Ugandan version of WTF. They couldn’t find a ticket with my name on it, and eventually I dug through my luggage to find my own copy, which revealed where the problem was. The fellow who I had handed my car to the morning I arrived there, a man called Male, had registered the ticket in his own names rather than mine! This, in spite of the fact that I had handed him my driving permit and patiently allowed him to hold on to it for as long as he wanted, doing the registration. No problem, I said, and paid up then got sent on my way. I walked all the way to the farthest corner of the parking lot with my luggage, only to find a Mercedes Benz parked right behind me. I hooted a little bit then realised I had to walk all the way back to the Administrator’s cubicle. I did so while wondering why the hell the chaps hadn’t alerted me to the possibility that I would be blocked and feeling quite sure that since there were only two cars of my make in the entire parking lot they should surely have known. My irritated musings were interrupted when I encountered my pal Richard fretting because his remote key fob wouldn’t work, and neither would his Prado key. He had left the car with the chaps and agreed that they would park it, so he was very unsure what could have possibly happened. We tried a couple of tricks with the remote key and the ordinary key, attacking all doors and pressing buttons while pointing at all parts of the vehicle but nothing worked. As we waited for him to return, the Mercedes Benz blocking me was moved but by now, it was obvious that I wasn’t going to make it to the dinner, so I tried to order for a drink for us as we waited. “You have go to the restaurant,” I was told. The small ensuing discussion about how good an idea it would be to have a few soft drinks sold at the parking lot was interrupted by the return of the confident askari, with the cocksure update that even if the cells weren’t actually available at the airport, he could get them from somewhere else nearby. We waited afresh, and secured phone numbers to summon mechanics to bring solutions and the restaurant operator to deliver drinks to us in the parking lot. The latter arrived within minutes, while the former eventually confessed, hours later, that it was raining and they couldn’t make it over. Without explaining the walking pace of the askari, as we waited for him to get to where he was going, let alone return, we convinced the fellows there to open up some other key fobs available so we could test with their batteries, and in the process one of the chaps licked the dry cells to confirm that they were indeed functional. Based on the saliva action, we all agreed that the problem must be the car battery. I remembered that some time in my distant past we often conducted this lick-the-dry-cell test and even then I wasn’t sure about it (but now you can google it). We started a fresh discussion about how wise it would be for the parking lot management to open up a shop selling car accessories like batteries for remote control keys or fobs, air freshener kits, insect traps, and so on and so forth. The fellows kept saying how “The problem is” and explaining why it wouldn’t work, so we just left the ideas there amidst the cars. Then, while discussing how the car battery could have run out, Richard reminded the fellows that he had left the car with them to park – most probably with the gentleman called Male, since we left on the same morning. Richard affirmed the memory, and even recounted that he had been assured that his Prado would be parked in the spot of the failed car when it was eventually moved. We talked through the various scenarios, my irritation rising every minute, and the askari returned unsuccessful to join us in discussions as we waited for mechanics to respond to our phone summons. Eventually, though, we found a taxi driver who had exceptional car opening skills, got the bonnet open, and charged the battery up. Immediately, the interior lights of the car came on – which explained why the battery had run out. The lights had probably been on the whole damn week, draining the battery. And that’s when I really felt like being a little violent. What kind of car parking attendants are these who aren’t proficient enough to tell that you have to switch off the interior lights? How often do they (not) patrol the parking lot in order not to have noticed the lights were on? Why were they incapable of managing parking so we don’t get blocked in?